(NewsUSA) - Natural cork is one of the planet's most versatile and useful materials. It is used to make everything from wine stoppers, to high-fashion items, to building materials. Natural cork can even be found as insulation on the space shuttle. Despite cork's many uses, there is still much confusion about the supply of cork and where it comes from. Contrary to widely held misperceptions, there is no shortage of cork. Nor are the trees cut down in the harvesting process. Like sheep, whose shorn wool grows back over time, the bark from a cork oak regenerates every nine years. Cork's journey from raw material to finished product begins with the annual cork oak harvest, which takes place during late spring and summer. 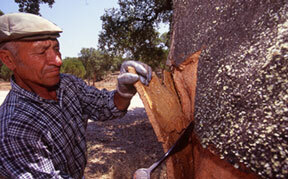 The cork oaks are harvested by highly skilled craftsmen, or debarkers, who safely strip only the bark from the oaks. On average, 90 to 130 pounds of cork bark are typically removed from a cork tree when it is harvested. The cork oak is the only tree whose bark grows back with a smoother texture, and each oak can live 200 years or longer. The initial harvest takes place when oaks are at least 25 years old; the oaks can be harvested about every nine years after that. The bark from the initial and second harvests can be used to make shoes, flooring, insulation and other industrial products. The third and subsequent harvests yield bark that is ideal for making wine stoppers. Cork harvesting also provides economic benefits. The debarkers are among the highest paid agricultural workers in the world, and according to the World Wildlife Fund, more than 100,000 people in the Mediterranean Basin directly and indirectly depend on cork forests for their livelihoods. Harvesting and maintaining cork forests also benefits the environment. The cork groves serve as refuge for more than 200 animal and 135 plant species, and they help reduce greenhouse gas emissions. "The Mediterranean cork forests are recognized to be one of the most important ecosystems in the world for preserving biodiversity, creating jobs and addressing climate change," says João Rui Ferriera, President of the Portuguese Cork Association. "The annual harvest helps ensure that the forests continue to thrive and benefit both the planet and people." Skilled "debarkers" harvest the bark from the cork tree.